Whenever I get the chance to attend a paranormal conference or event, or even just visit another state, I always try to find a few new books for my paranormal library. This past weekend, I attended ScareFest in Lexington, Kentucky and happened across the booth of C-Bus Paranormal, an investigation team out of Columbus, Ohio. I was initially drawn in when some information on the team's volunteer and fundraising efforts for Prospect Place caught my eye. I had the opportunity to investigate Prospect Place way back in 2007 and have always had an affinity for the history, culture, and of course, the paranormal activity of the location! Anyway, I was excited to see that two of the team members were selling a new book they had collaborated on, and I bought a copy. I absolutely love books written by real investigators out in the field. It's entertaining and enlightening to see how other teams operate, the places they've been, the evidence they've collected, and why they got started doing this type of work in the first place. Unfortunately, most of the books that I've picked up on this topic, while interesting, aren't necessarily very impressive. That wasn't the case with Ghostly Encounters. I was extremely impressed, first with the quality of the book itself. This wasn't a print-to-order self published, unedited piece of work---this was a REAL book. For only $20 (less on Amazon), this professionally published, attractive, well-written work was an excellent value and an excellent addition to my personal library. Secondly, the concept of this book really impressed me. 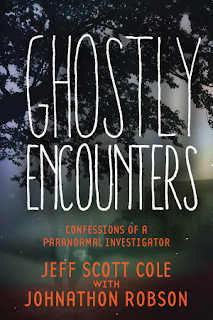 For the most part, it reads like a normal book you'd expect from a paranormal investigator. It begins with Cole's personal journey into delving into the fascinating field of paranormal research and how he joined the C-Bus team. It's followed by some techie information, another chapter furthering his personal journey, more techie stuff, and then a large section featuring some actual investigations at various pay-to-play locations throughout the country. In addition, the appendix offers a listing of paranormal teams by state, as well as a list of alleged haunted places that offer investigation opportunities. Normally, these types of books that feature investigations will mention potential video evidence, and refer to possible EVP data, but given the print format, all they can do is give a link and hope the reader will go check it out if interested. The authors of Ghostly Encounters really take a technological jump forward. Instead of just a mere link or a mention of their evidence, they've included QR codes directly within the text so that as you read about the evidence, you can use your phone or tablet and go directly to that evidence and see/hear it for yourself. And, if you don't feel like reading with your phone attached to you, the link is available so you can go back and check it out at your leisure. A well-written book with a cool, modern twist featuring my favorite subject is pretty awesome in any case, but I really enjoyed this book on a personal level. I seem to have a very similar philosophy and approach to investigation as the C-Bus team, with the main difference being that HPIR doesn't do a ton of pay-to-play locations. It's always nice to see others who share similar goals and ideas, and how they are applying those ideas to the furthering this field. 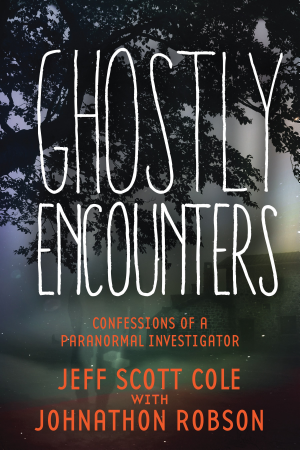 Ghostly Encounters was a great, quick read and I think that anyone with an interest in paranormal investigation, no matter if they are just starting out, or are a seasoned investigator, can enjoy this book. It's a great compilation of investigation experience and evidence, technical advice, and personal experience. I gave it a 5/5 stars!